Petr Eben is one of the foremost composers from the Czech Republic. Also known as an organist, he primarily performs his own works, but is also highly sought-after as an improviser on both the piano and the organ. 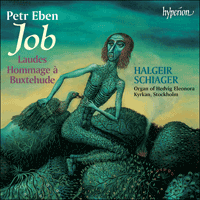 His works for organ are among his most popular, including Laudes and Job—both of which are on this disc. Job is one of two major cycles Eben has written. The Book of Job is seen by the composer to be extremely topical. It answers one of the most difficult questions on life asked to this day: Why do good people suffer misfortune? The material for this work, rich in contrast, is divided into eight movements, each of which express a theme based on a quotation from the Book of Job—Destiny, Faith, Acceptance of suffering, Longing for Death, Despair and Resignation, Mystery of Creation, Penitence and Realisation, and God's Reward. This CD is the first in a projected series of Petr Eben organ music.